(Bloomberg) -- The rally in riskier tranches of the corporate-credit market may be due for a pause, with forceful resistance levels coming into view. 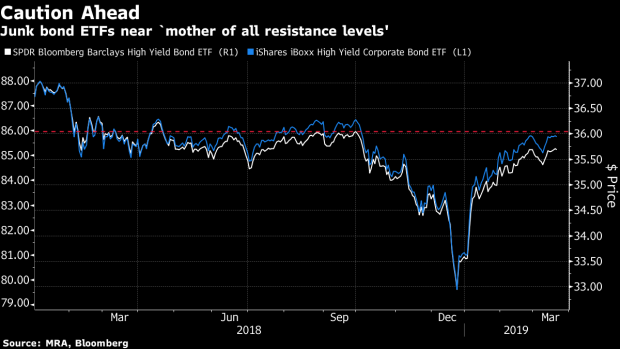 Both the iShares iBoxx High Yield Corporate Bond ETF, ticker HYG, and the SPDR Bloomberg Barclays High Yield Bond ETF, ticker JNK, are nearing price levels that have proved themselves staunch battle lines since the start of 2018. Investor thirst for yield, surging junk-debt issuance, rising oil prices and healthy risk appetite have all pushed the two exchange-traded funds within a hair of last year’s highs. Now the heavy lifting begins. Investors have been pouring cash into ETFs tracking high-yielding debt this year, with the category taking in more than $5.8 billion -- on track for the largest quarter of inflows since 2012. The $9.3 billion SPDR Bloomberg Barclays High Yield Bond ETF has led the charge, with more than $2 billion entering the strategy this year through March 19. --With assistance from Rachel Evans.